The nearest major town to our village of Aspley Guise is Milton Keynes. A product of 1960’s town planning, Milton Keynes takes a fair bit of stick for its roundabouts and concrete cows. “What’s the difference between yoghurt and Milton Keynes? The yoghurt has culture” or so the joke goes. The town has facilities to meet all the needs of it’s citizens, all easily accessible and convenient – shopping, leisure, transport, it’s all there. Everything is so well planned and dispersed, and people’s needs so well catered for that, even standing in the dead centre of the city, it feels a little like an industrial estate – faceless building, wide roads, lots of cars, lots of trees and a distinct lack of people. It feels, well, a little soulless. But then, when you least expect it, Milton Keynes surprises you. I was in the city this afternoon running some errands and, as the sun set behind the Church of Christ the Cornerstone located in the centre of the city, beauty appeared. 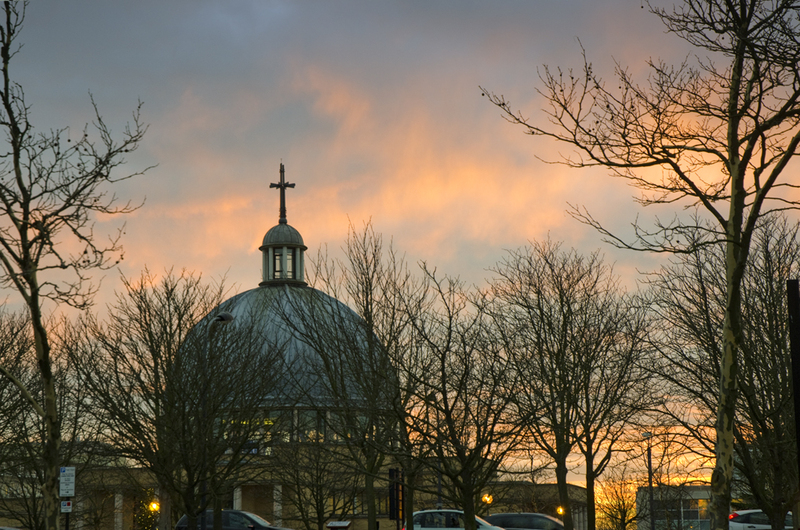 This entry was posted in England and tagged church, church of christ the cornerstone, concrete cows, England, Holiday, Milton Keynes, sunset, Travel by toscanakiwi. Bookmark the permalink.